Attorneys Hunter Klein, left, Jennifer Mizulski , and Matt Jett take part in a discussion titled "How Do I Get In?" 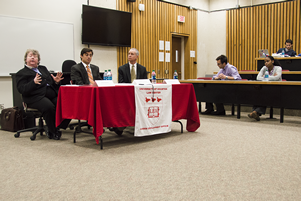 Feb. 19, 2015 -- Attorneys from several Houston-area small and midsize law firms this week gave University of Houston Law Center students advice on how to get a job and stand out once they are hired. During a lunch-hour discussion titled “How Do I Get In?” hosted by the Career Development Office, UH alumni Hunter Klein and Jennifer Mizulski and South Texas College of Law alumnus Matt Jett gave pointers on getting into a small or midsize firm upon graduation. Klein, of the small firm Robert Green and Associates, said the most important quality a prospective employee should have is the ability to multitask. He recommended students show “substantive involvement, across-the-board,” such as working on a journal or in a clinic, while in law school. Mizulski, an associate with the boutique immigration law firm Quan Law Group, said showing skill in “legal research and good writing goes a long way” in landing a job. Attorneys Jackie Houlette, left, Matías J. Adrogué, and Kenneth Harder and offer advice on "How Do I Stand Out and Make the Deal?" Jett of the midsize firm of Donato, Minx, Brown and Pool, said prior legal experience and grades are not the “end all, be all” in getting a job. But having some work experience, even in food service, indicates that the candidate has a good work ethic and is responsible. On Wednesday, another panel answered the question “How Do I Stand Out and Seal the Deal?” by offering students advice on how to secure a permanent position once they’ve gotten their foot in the door. Matías J. Adrogué, who owns his own small trial law firm, emphasized new lawyers should be prepared to do things they may not enjoy at first and recognize that they are gaining skills that will pay off in the long run. Jackie Houlette, a UHLC alumna who now serves as an adjunct professor at the Law Center, is a trial lawyer with the small firm Houlette & Gray. She said well-rounded personal interest can make a person stand out to a hiring manager. But it’s also important to be proactive. Kenneth Harder of Dunbar Harder, an immigration firm, said it’s important for prospective hires to emphasize specific skills they have that are valuable to the particular firms to which they are applying. Tuesday’s and Wednesday’s panel discussions were the final two of the Career Development Office’s Career Week, which began Monday with “How Do I Know if Small is for Me?” The weeklong series of events concludes Friday from 11 a.m. to 2 p.m. with an open house available to 2L and 3L students in the Houston Room, suite 220, of the new UH Student Center.